A beautiful view of the Grande Falaise from the road. 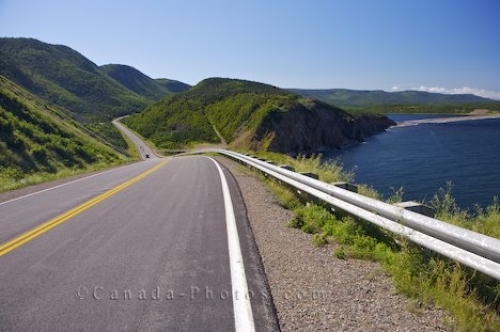 Cabot Trail leads into the awesome mountains with a view of the beautiful blue waters of the Gulf of St Lawrence. The road seems to disappear between the mountains. This mountain view is part of the Cape Brenton Highlands National Park. The Cabot Trail near Grande Falaise, Gulf of St Lawrence, Cape Breton Highlands National Park, Cape Breton, Nova Scotia, Canada. This road side view shows the Cabot Trail leads into the Grande Falaise, a beautiful mountain and ocean view.